Today is my Mum’s birthday and we’re going to Covent Garden to watch the ballet and drink champagne. It’s become something of a family tradition of late – in fact, on the basis that anything you do twice at Christmas can claim to be a tradition, this can claim to be a long-standing one. Could there be a better philosophy to consider as we head into the New Year? I leave you in Sarah’s capable hands. Traditional method sparkling wines are made in the bottles you buy them in – the grape juice is fermented first in a tank, then bottled in sturdy thick glass, more yeast is added and a beer bottle cap is put on. This forces the CO2 created in the second fermentation to be absorbed into the liquid making the wine sparkly. The additional yeast, having done its job, sits at the bottom of the bottle (referred to as the lees). The sparkling liquid is aged on the lees for varying amounts of time. Near the time of sale – the wine bottles are slowly tipped upside down over a period of weeks, and the yeast cells fall to the neck of the bottle. 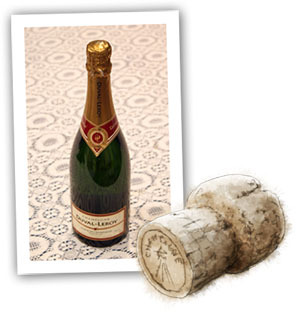 The bottle neck is then frozen and the bottle cap removed – the frozen plug of yeast cells pops out, the bottle is topped up and a traditional cork is wired in place. In the case of champagne the wine must be on lees for 18 months. The complex flavor that this creates is often described as bread-y or biscuit-y. Some of the best wines produced in this style are aged for up to 3 years on lees leading to very obvious toasty flavors (Krug is particularly known for this style).The best champagnes should be rich, lemon scented, with green apple and brioche flavors balanced with persistent fine bubbles. Pol Roger is my champagne of choice for special occasions – the Winston Churchill is my (and his) personal favorite. I also love buying champagnes from small growers such as P Louis Martin who are based in the Grand Cru Village of Bouzy and create characterful fine wines. Napa also produces many excellent traditional method sparkling wines, which, when tasted blind can easily be confused with champagne, although are often a little richer and more fruit driven. Look out for wines from Tasmania too – which are becoming very desirable and are made in a similar style. Finally I wouldn’t be doing my bit for England if I didn’t reference that we too are now producing some excellent Champagne-style wines – Nyetimber and Ridge View are two of the larger and better producers. If you can find them, buy them – they don’t disappoint. This style of sparkling wine is made in large steel tanks to minimize the lees contact and preserve the fresh flavors. It can be delicious drunk very cold on its own, but it really comes to life with savory nibbles – ham hock terrine, devils on horseback, mild cheeses etc. Asti Spumanti is a classic wine from a DOCG (classified quality wine growing region) in Piedmont, northern Italy. It usually has a very perfumed rose, quince-jelly, fruity aroma, with light bubbles and it can be anywhere from medium sweet to fairly luscious. Martini produce a very good value Asti too, and there are many smaller producers who have been making this style of wine for generations. If you enjoy your bubbles light and sweet, you should have plenty of choice in your local bottle shop. Many New World producers have focused on creating wines with sparkle, elegance and a gluggable dry fruit-driven taste – from South Australia, look out for Chandons Green Point, made in Victoria. France also produces huge volumes of crémant (sparkling wines made via the traditional champagne method) which are usually slightly less aggressively bubbly and more fruity than champagne, and can be great value. I especially like Crémant de Bourgogne which mixes perfectly with crème de cassis (the best producers based around Dijon) to make a Kir Royal. Falling into this category broadly speaking would also be modern Cava producers. However the star of this style has to be Prosecco, which comes from Veneto in the hills north of Treviso in Italy. This is made from the Glera grape variety and is now usually produced in a dry style. The best proseccos have great peach blossom and pear aroma, small bubbles and crisp acidity. Look out for Val D’Oca from Valdobbiadene which is the brand poured in the famous Harry’s bar in Venice where the first Bellini was allegedly mixed (with small addition of fresh peach puree). This entry was posted in The Wednesday Tipple and tagged ballet, bellini, cava, champagne, Christmas, Harry's Bar, kir royale, prosecco, sparkling wine. Bookmark the permalink. Pink champagne is the best cure for jet lag. Who knew!